We’ve been surrounded by news claiming that the diets of American children and adults are shamefully unhealthy, with junk food consumption especially rampant among ethnic minorities, the poor and children. We’re told that eating habits are so bad that they’re creating a medical emergency of hurricane-like proportions, wrecking havoc on families and our society, and necessitating extreme measures to tell people what to eat. The U.S. government just released the latest “What we eat in America” report this week. 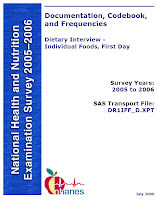 This is the dietary survey component of the National Health and Nutrition Examination Survey (NHANES), conducted on a cross section of the population by the Dept. of Health and Human Services and the US Dept. of Agriculture. NHANES is viewed by healthcare professionals as the most accurate data on our diets, lifestyles and health, and the information is supposed to be used to help guide public health policies. So why was this important report ignored by the media? Perhaps, because the actual data doesn’t support the doomsday claims or the over-the-top public policies being enacted. In fact, it reveals that the obesity hysteria might be leading to some adverse health effects. These large-scale NHANES surveys have been conducted on Americans since 1971 and involve in-person and telephone interviews on two random, nonconsecutive days to compile detailed 24-hour food consumption data. 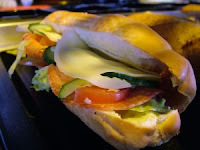 * For this new “What we eat in America NHANES 2005-2006” report, the surveys had sampled an over-representation of weekend days; and oversampled teens, African-Americans, Mexican-Americans, seniors and low-income people; attempting to identify the worst case scenarios. And still, the data didn’t paint the picture being popularly spun of a nation of junkfood-eating couch potatoes. Despite activists claims that we’ve become a nation pigging out on gargantuan amounts of food, total calories among adult men and women averaged 2,157 kcal/day — slightly less than the 2,178 kcal/day reported in 2001-2002. Men averaged 2,638 kcal/day. Women (20 years+) have been eating continually fewer calories, today averaging only 1,785 kcal, below recommended levels for moderately active women. There is simply no evidence that we’re overeating fast amounts of junk. The origin of the oft-repeated urban legend that our caloric intakes have skyrocketed to a whopping 3,900 kcal/day, as we’ve examined, is a misunderstanding of USDA Economic Research Service data. This is economic information on the supply of food produced in this country, which currently equates to 3,900 calories per person, as compared to 3,500 calories per person in 1909. But extrapolating people’s actual dietary intakes from food supply data has been repeatedly shown to be faulty and to wildly exaggerate actual consumptions. Economists at Harvard Institute for Economic Research noted that only in recent years has wastage been accounted for — which they’ve found done imprecisely at best. 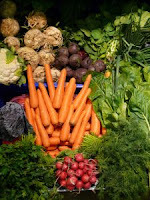 More significantly, this raw economic data doesn’t consider industrial and other uses for foods, which are extensive. As David Klurfeld, Ph.D., professor and chairman of the Department of Nutrition and Food Science at Wayne State University, editor-in-chief of the Journal of the American College of Nutrition and Nutrition New Focus wrote about the “absurdity” of using this data to estimate what Americans actually eat: “...soybean oil is used to make ink, lubricants, diesel fuel, plastics and many other useful products....and the U.S. feeds millions more people outside the country and we don't have to eat six meals a day to get rid of surplus crops.” Even school kids know George Washington Carver developed more than 300 uses just for peanuts — from paint, explosives to kitty litter! And Midwest-grown corn is becoming ethanol to fuel our automobiles and farm equipment. Well-conducted dietary surveys, while not as precise as clinical measures, have been shown to be surprisingly close reflections of intakes. And, despite assertions that people lie more so today than in past decades, there is no evidence for such claims. Over the past forty years, NHANES data has been recognized among medical professionals as the most reliable population data available on the foods eaten by Americans. This week’s report also showed that dietary fat consumption was also not increasing. Total fats among all Americans over age 2 (men and women) averaged 33.6% of calories, within dietary guidelines. This compares, for example, to 1977-78 data when 40% of our calories came from fats. In contrast to widespread beliefs that minorities and poorer people eat nutritionally worse and more calorie-dense diets, the nutrient intakes by race/ethnicity show that whites averaged 2,198 kcal/day — more than Blacks at 2,095 kcal and Mexican-Americans at 2,109 kcal. Diets were similar among the ethnic/racial groups in most major nutrients such as sugars and proteins. But Mexican-Americans were consuming more dietary fiber, less total fats and saturated fats, less sodium, and less alcohol than other groups. The prejudicial belief that poor people eat worse diets was also not supported in this government data, just as it hasn’t in 196 studies conducted in the U.S. and other developed countries, recently reviewed. Higher family income was related to higher calories and dietary fats, and unrelated to carbohydrates consumed in this latest NHANES report. Average calories by people in families with annual incomes less than $25,000 were 2,104 kcal; families earning $25,00 to $75,000 consumed an average of 2,139 kcal; and those with incomes over $75,000 ate an average of 2,238 kcal/day. Overall, Americans (2 years and over) are consuming slightly fewer carbohydrates and sugars, slightly more protein, and similar amounts of fiber and fats as compared to recent surveys. Since the 2001-2002 report, average calcium intakes are up nearly 100 mg/day for nearly all ages. And most vitamins (other B vitamins, vitamin E and A) and minerals, including iron, magnesium, zinc, copper and selenium are higher. The new data doesn’t support the need for public policies to address unhealthy gluttonous eating, and prohibit access to fattening foods. It does, however, provide clues that the anti-obesity hysteria might be contributing to risks for adverse effects, especially for young people. Children 2 to 11 years of age are eating notably fewer calories, less fat, sugars, and protein than in 2001-2002, trends that not only disprove the necessity of interventions to encourage less fattening diets among children, but that obesity concerns could be leading children to be at risk for dietary shortfalls. And folic acid among teen girls and women of childbearing age, for example, has continued to drop since 2001-2002, as many avoid enriched flour breads and baked goods, believing them to be unhealthy and fattening, and favor wholegrain products that aren’t fortified, putting their babies at heightened risk of birth defects. The important “What we eat in America” report would have been splashed across headlines from every media outlet in the country — had the report shown us all to be gorging on junk. But it didn’t. And good news is seen as bad news in today’s topsy turvy reality.